Catalog of SEKN Network’s educational cases. All cases can be downloaded from the Harvard Business Publishing publications webpage. The case looks upon difficulties faced by companies such as Supercompra when trying to develop commercial relations with low-income suppliers through market mechanisms; it also elaborates on how Supercompra handled these relationships. Therefore, the ACR requested greater commitment from the company in the form of a massive campaign to broadcast the initiatives, in an attempt to motivate and increase the number of participating companies. Hocol was determined to understand the changing needs of society and to contribute to their satisfaction by strengthening grassroots organizations and governmental institutions. This case describes the practices and techniques used by Tierra Fértil in these neighboring countries’ different settings, enabling students to draw their own conclusions about the program’s effectiveness in both Costa Rica and Nicaragua. Reciclare had to adopt scale-growing strategies that strengthened its leverage in its value chain, while professionalizing its associates, building ties with large recycling companies and public agencies, and raising awareness among city residents so that they would provide a greater recyclable volume. This case may also be used to help members of NGOs, foundations, etc. to understand the challenges faced to compete in the marketplace and, at the same time, uphold organizations’ values and mission. Finally, the case explains how FPVS rose to the challenge of worsening local social and economic conditions in 1998, developing alternative programs to appeal to new borrowers. As these initiatives proved ineffective, FPVS turned to other projects, based on the demands voiced by its target communities. This case analyzes a successful economic initiative (Escudo Rojo) whose profits help support a legendary religious institution (The Salvation Army) while creating social value for low-income sectors through the sale of used goods. This case may prove useful for courses on entrepreneurship and startups’ early development, as it illustrates how to build a sound, sustainable business. It may also be used in courses dealing with base-of-the-pyramid business ventures, cross-sector collaborations, and economic and social value creation in businesses involving low-income sectors. Against this backdrop, INACAP’s leaders chose to seize the opportunity to acquire Universidad Vicente Pérez Rosales. However, this decision involved a change in INACAP’s strategic positioning. A few months after the acquisition, INACAP’s chancellor resigned, and the new chancellor, Gonzalo Vargas, faced the need to assess INACAP’s long-standing business model and determine its competitive strategy. This case zeroes in on an inclusive business development based on a collaboration that involved a business company, an NGO and local neighbors. It may be used in graduate programs on business and society, corporate social responsibility, or business strategies targeting the base of the pyramid. This case may be used to encourage class participants to discuss economic feasibility for social projects, analyzing sustainability and its fit with organizations’ missions. Specifically, this case provides an example to consider the development of business portfolios, discussing whether individual ventures contribute to value creation and mission accomplishment. At the same time, it leads students to reflect on the key factors to be taken into account in order to ensure portfolio success. This case discusses ARCOR Group’s marketing, manufacturing and social intervention expansion process across national borders. This Argentine company’s path to internationalization has been illustrated by the strategy it pursued in the Brazilian market over the 1990s. As a result, ARCOR successfully took its brands and products to over 100 countries in all five continents. Starting with its first plant in Brazil, set up in 1981, the Group began to manufacture candy locally to complement its imports from Argentina. Fe y Alegría: One or Many? This case describes the challenges faced by a social organization that has managed to build a very successful organizational format to expand its operations across Latin America, suitably addressing local specificities but direly limited to grow internationally. This case has been designed to help students. At that time, excess chrysalis supply not only damaged his business but also jeopardized the welfare of dozens of growers, including many low-income farming families, and threatened the social progress made over the past few years. The decisions made by Labor in this regard will have long-term repercussions for its own development, as the organization will be forced to revisit its ties with a significant share of Ilo’s population, its mayor and Labor’s donors. This case may be used in leadership courses, to deal with succession issues, and in nonprofit management programs, to address topics such as venture sustainability and organization. This case has been designed for corporate social responsibility graduate and executive education programs. This may prove particularly useful in courses on social corporate responsibility and strategy, or sustainable development. It may also be used in entrepreneurship programs dealing with corporate social ventures. This case may be used in courses on business or organizational strategy for social enterprises. More generally, it can prove useful in courses focusing on the links between organizational goals and strategies formulated to pursue those goals, taking into account environmental restrictions. Integrating social initiatives into corporate strategies. This case may be used in a business strategy or policy introductory course incorporating nonprofit management specificities. Case discussion should allow students to gain a better grasp of the CSR-related issues affecting corporate management, communications and image, as well as the challenges often found in CSR ventures. Case readers are encouraged to characterize CSU-CCA social programs and to play the role of Manuel Zuñiga, Corporate Affairs Department Head and Social Responsibility Committee member, who, at an upcoming meeting, would have to recommend which social ventures to support and which not to. This case provides an opportunity to discuss the progress and opportunity windows in organizations’ social responsibility adoption and institutionalization in their operations and culture. This case may be used in courses on social venture management, corporate social responsibility and organizational behavior. 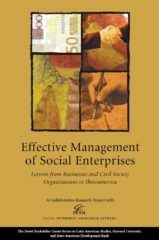 This case may be used in courses and seminars on social entrepreneurship and third-sector organization management. It may prove particularly helpful in courses dealing with its two focal themes: third-sector organizations’ sustainability and the tension between opposing roles: private service supply and public good production. This case is suitable for any graduate program on business management focusing on nonprofits and dealing with strategic analysis and planning, decision making, and market analysis. This case intends to introduce some notions associated with social private companies’ social endeavors and the links connecting these programs with their competitive strategies. This case may be used in graduate and executive education programs, specifically at courses on social corporate initiatives, leadership, ethics and organizational change. This case describes one of the first geographically-focused foundations in Mexico, Oaxaca’s Community Foundation (FCO, for its Spanish acronym). This case may be used in courses discussing organizational format design and the use of collaborative management schemes in civil society organizations. A number of studies reveal that third-sector organizations tend to build networks to drive CSOs’ institutional strengthening and organizational development. This case is suitable for any graduate program focusing with corporate social responsibility, especially to deal with social venture creation, development, growth and assessment. This case unfolds in Chihuahua, one of Mexico’s largest and most industrialized states located in the country’s Northeastern region. This case may be used in Human Resources Management courses that zero in on defining HR’s field of action, the relationship between HR management and corporate foundations in community activities, and the management changes in both areas resulting from the arrival of new shareholders with a different vision regarding social work and Human Resources. This case may be used in courses on corporate social responsibility, NGO and social venture management, intended for both social development specialists and managers at large. This case is appropriate for management courses focusing on nonprofits’ strategic decision making. Through the analysis of the case, instructors should discuss the features of the new social venture created in this process and its outcomes over this three-year period. When, in 1991, a trust was created to raise funds for the first interactive museum in Mexico, one of the first companies to commit to the project was Bimbo Group. The leading bread manufacturer in Latin America had decided to support the construction of the Papalote Children’s Museum. While this was not Bimbo’s first or most significant social responsibility venture, it certainly was the project that enjoyed the company’s deepest engagement. McKinsey is a worldwide consulting firm that operates in 43 countries, while Fundación Compromiso (Commitment Foundation, FC) is a highly professionalized nonprofit organization that provides training, counsel and technical assistance to other nonprofits, effectively helping them to improve their management and enhance their impact. The Ashoka Association, an organization supporting social entrepreneurs throughout the world that had an international partnership with McKinsey, served as a liaison between both FC and McKinsey. Manuel Ariztía (Don Manuel), respected owner of a leading Chilean poultry company, has forged an alliance with Melipilla, a Chilean municipality, to collaborate in the management of the local 13,176-student public education system. The instrument used for this partnership was Melipilla’s Municipal Corporation (CMM), a private, independent and apolitical nonprofit organization that provides educational and healthcare services in the city. Over the past fifteen years, Don Manuel has become a leader at CMM’s Board, driving changes in the organization’s financial and educational performance. This case describes the evolution of this leadership role, highlighting issues associated with management succession, decision making, cultural change and collaboration challenges. This case may be used in courses on cross-sector strategic alliances, private social investments, and the role of corporations in society, speeding up decision making processes involving these issues. This case provides an opportunity to understand how alliances deepen over time, as well as to learn to identify relevant agents for their consolidation. As RPN’s success hinged on the combined efforts all partners, the program’s head had to run her idea by all of them. She also struggled with other questions regarding RPN’s future. The program needed to find ways to engage packaging producers and users in a more committed, lasting fashion. Despite the lodge’s success, RFE’s management faced some trouble with the community staff. Turnover was compulsory every two years, and the community was not large enough to provide new qualified personnel that often. The community itself had some old internal problems of its own that had a negative impact on the business relationship with RFE, too. Lodge operations were also compromised by frequent irregularities in airlines that brought tourists into Puerto Maldonado, and by the lack of good local suppliers. How can the company balance its search for significant business results with the corporate responsibility actions required and the stakeholders involved in the Ekos line? How should it choose its partners and establish their roles in these initiatives? What drivers have Natura and its partners identified as safeguarding their partnerships’ effectiveness and value? How can Natura engage partners with such diverse cultures in a single effort to ensure organizational and community sustainability? Can the alliance serve, incorporate and add value to stakeholders so diverse as the producing Amazonia and the consumer market? These are the questions class participants have to explore in this case. This case proves useful to: Show students the paths taken by a philanthropic partnership and a collaborative alliance. Discuss the roles played by partners in social alliances, Discuss the consistency between the partnership’s work and its goals. 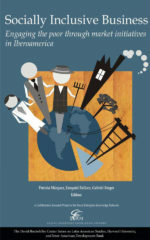 This case may be used to explore the following topics: Business companies and their interactions with their surroundings –socially with neighboring communities, and politically with the State, Value creation in cross-sector alliances, Public engagement by private business leaders, Educational institution management. This case illustrates a number of ways to promote grassroots partner development, to create value in alliances with grassroots groups, to analyze income and productivity, and to manage outsourcing-associated risks. Additionally, both cases provide enough information to elaborate on the business reasons that may lead the company to engage with its surrounding communities, finding creative ways to interact and partner with its stakeholders. Indupalma (A1): The Initial Years, 1961–1977 (A1). As it shows how forging ties with the community tends to follow business needs, the case is suitable for the analysis of topics such as strategic management and change processes, corporate strategic approaches, and business opportunities and challenges posed by social contexts. Let’s Build Their Dreams: Danone Mexico and the Casa de la Amistad para Niños con Cáncer, I.A.P. This case helps class participants to understand how a partnership evolves dynamically as a result of their analysis of a number of business decisions, namely: a) linking the company’s social projects to its marketing strategies, and b) keeping the award program under CENPEC management or decentralizing associations, so as to secure greater legitimacy in the communities where the Bank operates. This case may be used in social organizations’ leadership courses and other courses exploring collaborations in the social sector. This case may be used in courses on logistics, value chain management, inclusive businesses, and social responsibility. Case B in this series presents the epilogue on the relationship between Corporación Minuto de Dios and Asocolflores, covering the first eight months in 2002. It can be handed out to class participants during case discussion, to provide further information on salient features in alliance building processes. This case may be used to deal with the following topics: Social ventures’ inception, evolution and professionalization, Cross-sector alliances’ creation, development, management and challenges, Business companies’ efforts and impact in social issues. This case may be used in courses on social organizations’ management, to close a section on alliance building, to analyze a complex, cross-sector and multi-tiered partnerships. 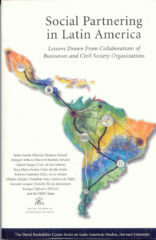 This case may be used in social organization management programs dealing with alliances, cross-sector partnerships among non-governmental organizations and private companies, social responsibility, and Jim Austin’s theoretical framework (the “Collaboration Continuum” featured in The Collaboration Challenge, Jossey-Bass Publishers, 2000). This case may be used to introduce some notions associated with social ventures and to characterize the (donor-recipient) relationships maintained by private companies with EJN’s program as well as the opportunities available for more stable, long-term ties, like the relationship built by UNICEF and EJN. This case is suitable for strategy courses focusing on alliance development, strategy valuation and selection in cross-sector collaborations. This case provides an opportunity to analyze the role of organizational leadership in alliance building, the use of specific corporate resources for social responsibility projects, and the benefits afforded by partnerships between business companies and NGOs. By discussing this case, students can gain a better understanding of how competitors can collaborate in some areas, as well as the need to renew the value created for individual partners in order to keep an alliance alive and fruitful. This case may be used in programs dealing with social entrepreneurship and corporate social responsibility or other graduate courses that delve into cross-sector collaborations among business companies and nonprofits. This case will prove useful to analyze collaborations between NGOs and private companies on the basis of “customized” educational projects helping to meet companies’ strategic needs.